So I had never heard of this link-up until a few weeks ago. I think someone on twitter posted a link to it….at first I thought this is an INSANE idea. I blogged everyday for 7 days a few months ago and man that was a lot of work. 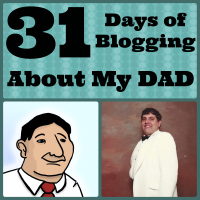 Then I noticed people blogged for 31 days about interesting topics that they were passionate about or knew a lot about. Well that seemed a little bit easier. One night in the Five Minute Friday twitter parties me and some other singles joked that we should do 31 Days of Forever Alone….I seriously wanted to do it because I would have had fun with it but then I decided that would have made me look pathetic and lonely..so I sacked that idea. I started thinking about all my little “web projects” and then I thought this challenge could be the motivation that I needed to finish them. You see I started this web project to build a website in memory of my Dad that passed away 19 years ago as a form of healing for me. Which it has been because it’s forced me to go through boxes of stuff, pictures, and research about him. But at the same time I’m a big time avoider and will look at some things and then I just leave them at the side and don’t touch it for a few weeks. I started this project in APRIL of 2012!! So yeah I’ve paid for the domains and the hosting for this website for over a year and it’s still not finished!! My goal was to get everything up by his birthday August 2012…then it became the anniversary of his death in April 2013….well last August I wasn’t in school so I thought I’ll do it then and by his birthday August 2013 it’ll be done…yeah I haven’t made much progress…So I’m DETERMINED to work through this project in October 2013 as part of 31 Days of Blogging. So the way I do this is going to be a LITTLE bit different than how other bloggers are doing it. See I don’t want to clog his website up with linky’s and link-up buttons as once everything is up it’s basically going to be done and will be up for people to view. It’s more of a professional website…so I’m going to post excerpts and link’s on my blog here and link you over to what I did that day. Also somedays I may not really “blog.” You see my mom scanned about 1000 photos over the summer except they all need some serious TLC. They need to be cropped and re-saved. So some days I may work on that verses actually writing. Other days I may work on emailing people asking if they want to write something about him for the website. But I’m hoping to document all these things on this blog so I can track my progress and maybe by the end of October I’ll have this website 90% done. I will be posting links to each days results on this page here. So here goes nothing…it’s going to be a CRAZY (but rewarding) month! Hi, I’m doing a similar thing with the 31 days. My project is in memory of my stillborn daughter, and I’m hoping to sort through my collection of art, writing, cards, etc. related to her and figure out what to do with it. I’m thinking about some kind of self-published book. Sounds like you have a great, and ambitious plan! I am encouraged by your project and look forward to following along.